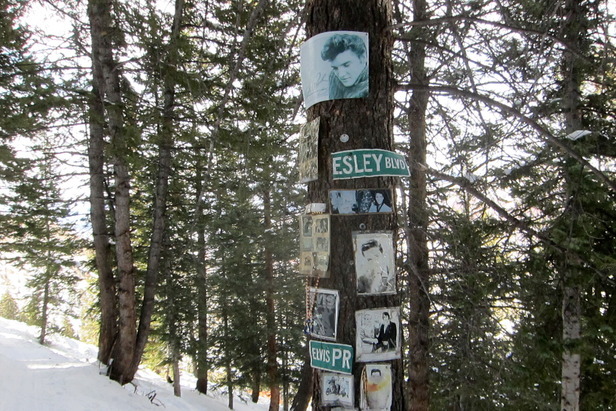 The Elvis Presley Shrine on Aspen Mountain. Later, I convince a couple of buddies to hunt for the Elvis Shrine, arguably the area’s first woodland sanctuary, installed sometime in the 1970s. It’s one of the only shrines to be detailed on an official trail map, a kid’s guide to Aspen/Snowmass. Just over the Ridge of Bell Mountain beneath the gondola, we head into a sparse glade of moguls. It’s dim, but eventually we find the traverse, which leads to two stately trees. We see the shrine’s original emblem, a broken street sign from Memphis, plus license plates, photos, memorabilia and beads. (Behind us a stone’s throw away, the Marilyn Monroe Shrine—a few faded photos and lace bra that’s seen better days—sits forlornly.) Every year on January 8, a group of fans come here to commemorate the birth of the King. Amanda Rae moved to Aspen in February 2012. She’s been searching for shrines ever since.